You are making a difference and now it's time to share it with the world! 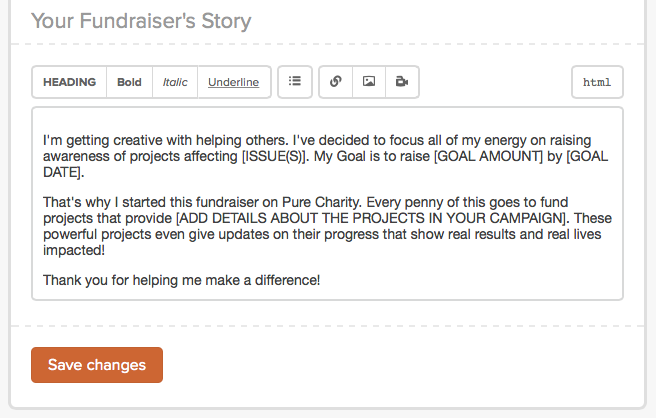 Editing your fundraiser story allows you to tell your fundraising story better! Fundraiser personalization is a great way to connect with people and let them know exactly why you are fundraising and how they can be apart of it. Follow the directions below to learn how. Step 2: Scroll down to “Your Fundraiser’s Story” section. We have already provided a sample text for you. You can use what we have written, save parts of it, or start from scratch! Just don't forget to click "Save changes" when you're done. Want to personalize your story even more! Learn how to add pictures to your story!